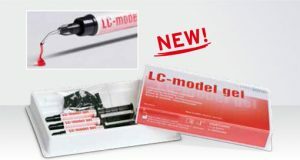 LC-model gel is a completely combustible, light-curing modelling resin based on methacrylate, gel-like in consistency and suitable for a wide variety of dental indications. LC-model gel is characterised by high moulding accuracy, high mechanical strength and complete combustion. The material can be polymerised easily up to a layer thickness of 2–3 mm. For polymerisation, any commercially available light curing unit (320 nm–500 nm) is suitable. connections and webs, fixations, splintings, partial dentures etc.